The FLOTA CAPRI 37 , Puerto Vallarta. Fleet held its first race to Chamela, a small village 130 miles south of Banderas Bay. The conditions could not have been better. Warm weather and winds up to 20 knots made for an incredible race with close competition. Azteca and Dread Naught had a great start off to the south while Crew 2, Borat, and Chevos struggled to get back into the race. Chivos had Ullman Sails Team members Chuck Skewes and Rodrigo Cuellar Dipp on board. After the boats made it half way out of Banderas Bay, Chivos and Crew 2were battling out for the lead. Chevos lead out of the bay and past Cabo Corrientes. The boats kept their position for most of the afternoon. Around midnight Azteca had big gains and took the lead from Chivos. With a little more wind outside Chivos regained the lead and held into Chamela to take the victory. 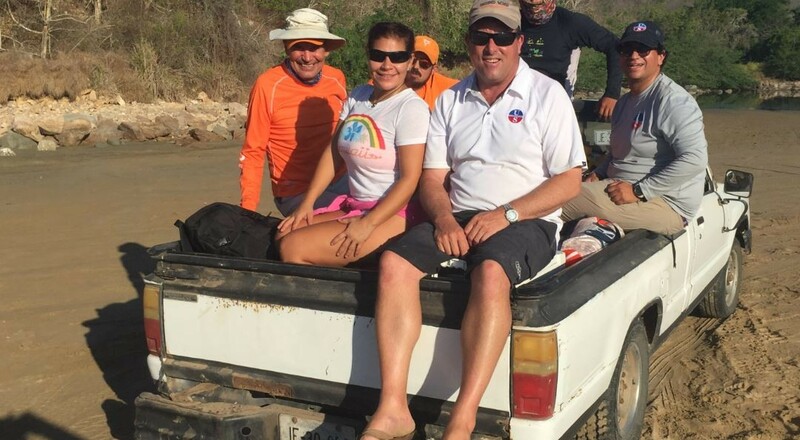 One of the crew on Chivos suffered an injury from getting his hand caught between a poorly driven panga and the side of Chivos. He was sent to Guadalajara for surgery and is doing well. The post race parties were very fun with Ullman Sails Puerto Vallarta handing out T-Shirts to the entire crowd.